Email isn’t going anywhere. People will be reading their email on their wearable technology. Read more to stay on top of this fast growing trend. With big names jumping into the smart watch market, it seems that wearables have announced their predominance in the gadget world. Technology is evolving at a fast pace and reshaping consumer behaviour and preferences. It is more than likely that very soon people will be wearing emails. This can spell trouble for email marketers if they aren’t equipped to send ‘smartphone friendly emails’. Wearables impose limitations on email design as well as on related metrics. More importantly, they change the way humans interact with mobile emails. However, Google is trying to make things easy by redesigning its trademark product, Gmail to make it more wearable-friendly. With an impressive increase of 67.2% in shipment volume of wearables, marketers should have no thoughts of snubbing them for marketing campaigns. Before knowing some strategies regarding the design of emails for wearables, let’s try to understand wearables better. It’s been over a decade when the first wearable was launched. However, it is the last couple of years where the wearables segment has shown a healthy gain in the electronics market. The Pebble smartwatch, Google Glass prototype, and some more wearable products were unveiled back in 2013, at this point in time many companies started focusing on smartwatch development. This move soon led to android wear platform and other smartwatches powered by it. The Samsung Gear, LG G Watch, Sony Smartwatch 3, Moto 360, Samsung Gear S, and Sony Smartwatch 3 were all released during 2014. Apple marked its presence with the launch of its first smartwatch, the Apple Watch, which entered the market in April 2015. The Watch has redefined and formalized its respective market, just like the iPod and iPhone. Apple watch offers the best variety of features, and most of all, it gives an uninterrupted integration with the iPhone. According to tech pundits, this was seen as an end of the mobile era. 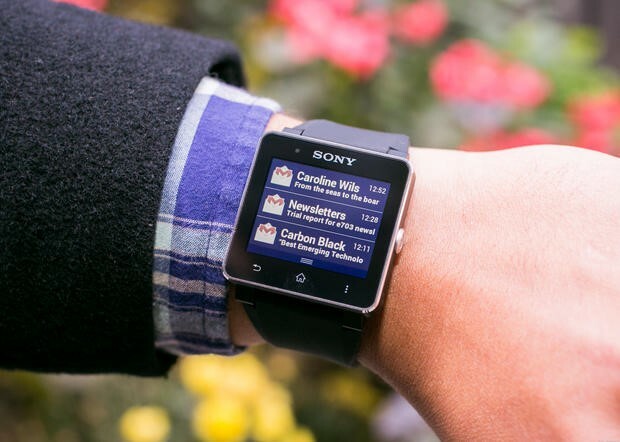 Wearables have changed the way humans interact with mobile emails. Given the technological and physical limitations, most email clients must provide the simplest possible format of email on the device. When an email is received on the device it alerts the user and lets user evaluate or estimate the information. In case if the user is willing to reply or get more engaged with the email, he has to switch to another screen. However, some devices do offer a handful email actions like delete, flag, etc. Here are some strategies to keep in mind when designing emails for wearables. 1.Back to plain text or HTML? The biggest challenge for an email marketer is to choose between plain text and HTML. Depending on the user’s request or because of slow browser, HTML emails get automatically converted to plain-text. However, this does not happen very often, so marketers don’t invest much time customizing the plain-text version of an email. If bringing the Apple Watch into the picture, the plain-text version will always be displayed which will need to change. People who read emails on tablets and laptops are fond of images. They are an easy way to break up long-form content, set a tone, and get more clicks. However, heavy images might not load on wearables, so you can’t rely on them when designing email campaigns for wearable devices. This may change in the future, but for now, limiting the use of images in email campaigns for wearables can be of practice. There is no stock Internet browser on the wearable devices, so links in emails might get disabled. This is because the purpose of wearables is to get quick notifications, rather than surfing the Internet. In the case of transactional emails, they can prove healthy for marketers even on wearables as they are more one-to-one. Transactional emails are triggered based upon the user’s action. Usually, the content of a transactional email is optimised in such a manner that user is tied to the mail and there is minimal scope letting user out of the email. Considering the Apple watch, there are a couple of exceptions to this rule about links. For example, addresses and phone numbers will remain clickable. Clicking addresses open the maps feature, and phone number triggers the call feature. A marketer can take advantage by using these extensions appropriately. Email subject lines will get cut off if they’re too long, particularly on mobile devices. Subject lines with fewer than 50 characters are recommended, just to make sure that the people scanning your emails read the whole subject line. If you’re striving hard to keep your subject lines short, think about where you can remove a fatuous detail and words which are of less importance. How about using a set of emoticons to make your email even more compelling?! For a marketer, the act of tracking email metrics becomes tricky because a one to one tracking image will not display on a wearable, and you can’t track links. On some devices like Apple watch, one can’t even determine whether your emails are being read or not because Apple has simplified the traditional code and has not released any application to track email metrics. This doesn’t mean you shouldn’t try to track what is working and what isn’t. One possible method of tracking is using promo codes that are exclusive to your Apple Watch email campaigns. That way you know when an email on a wearable device has converted. Wearable technology could create some design challenges. 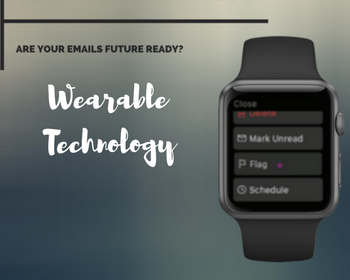 Responsive design has been heavily emphasized in recent years, however, this new technology will undoubtedly revolutionize the industry and challenge designers to figure out new ways to enhance email design for wearables. This does not mean the responsive design is going away. Research suggests, the number of subscribers consuming email on mobile devices will continue to rise and many are possibly sorting out an email that they can read on the go.